When you have a baby you may well find your idea of the perfect holiday changes. Whilst a few intrepid families are still willing to backpack into the unknown with baby in tow, many more now find they want a very different kind of holiday and a self catering holiday can tick a lot of boxes. Here are my 10 reasons to choose a self catering gite, specifically us at Eco-Gites of Lenault in Normandy, when you are holidaying with a baby. If you choose gites or cottages that are set up to welcome babies you'll need to pack a lot less stuff. 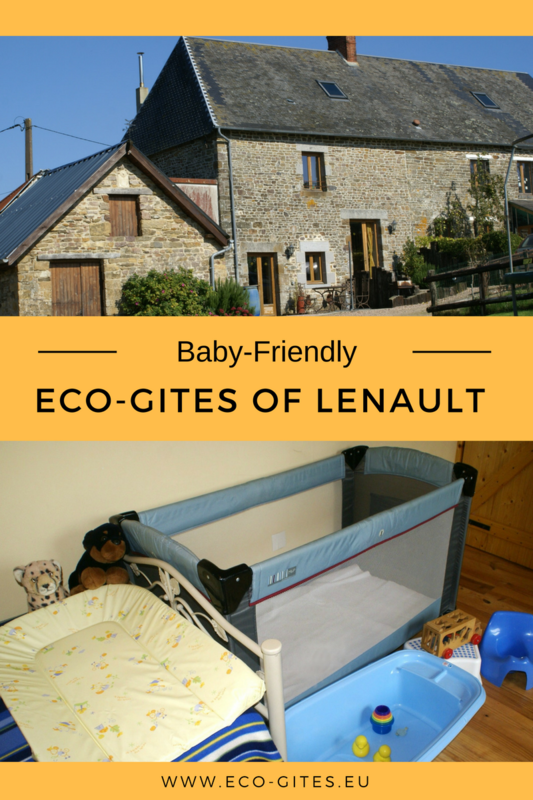 Many do supply a cot and high chair as standard but at Eco-Gites of Lenault we go much further. Click here to see the full list of what we supply for your baby. Eco-Gites of Lenault is just an hour from Caen ferry port or 4 hours from Calais. There are no long haul flights involved (unless you happen to be coming from Australia or Peru for example) and no need to hire a car or test out foreign transport systems. We also have a code to give you 10% off crossings with Brittany Ferries. Once you arrive everything is set up ready. There is no queuing at reception waiting to find your room, all the baby kit is in place and you can get settled in straight away. When you self cater you are free to carry on with your normal routines. You can come and go as you please, exactly as you would at home making everything more relaxing for you and your baby. In self catering gites you have no need to rush down to eat your meals at a set times in what can be a busy and noisy hotel restaurant. You can eat what you want, when you want, in the relaxed atmosphere of your own dining room or garden. If you are weaning your baby then you'll have a well equipped kitchen to prepare those purées should you not fancy feeding your baby ready-made baby food as well as a freezer to store extras. Eco-Gites of Lenault has all the bowls to prepare baby food plus a microwave, stick blender (on request) and baby plates and spoons. There's even a bib if you forget to pack one. We all know babies are not always quiet but when you are in a self catering gite then you don't have to worry about disturbing other people. You can also put your baby down for a nap knowing they won't be disturbed by other guests. Babies might be small but they do take up a huge amount of space - space you may not have in a hotel room. Eco-Gites of Lenault is lovely and spacious with 3 bedrooms so you won't find yourself hiding in the bathroom all evening as we did on one hotel holiday when the boys were very young. Never again! 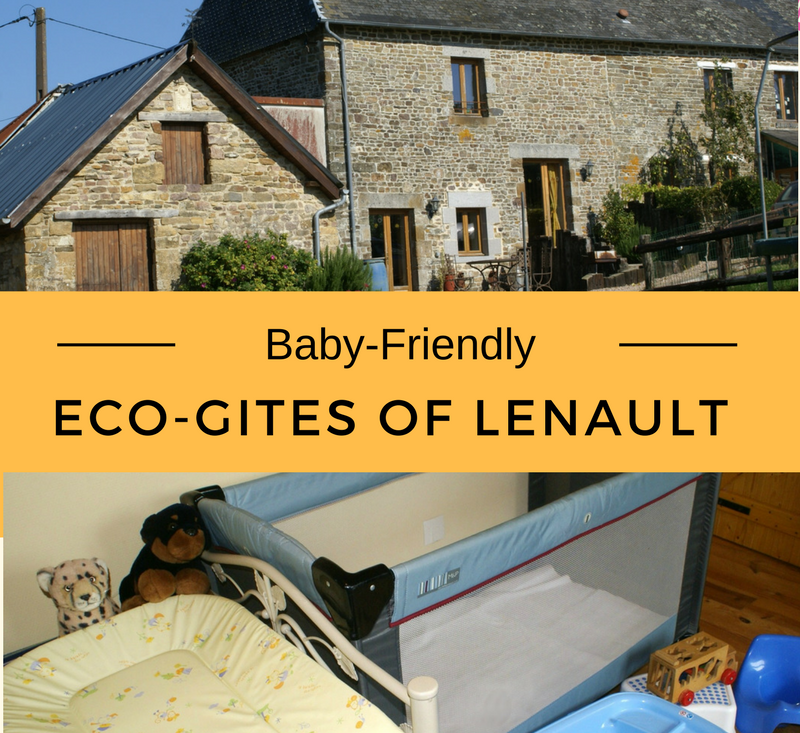 At Eco-Gites of Lenault you do not have to worry about waking people in the next room if your baby is a bit vocal at night. We are your only neighbours and the thick walls between us and the gite mean we never hear you. We have a detailed information pack in the gite and can advise you on baby friendly places to go ... and maybe the odd place to avoid! However if you just want to unwind here then we can offer plenty of peace and quiet as you relax in our sun loungers, hammock or comfy sofas. For toddlers and older children we have a large play area that will keep them amused for hours. Many gites, like ours, are family owned and run so by booking such a holiday you are helping support both these small businesses as well as others locally. On a self catering holiday you will buy food from local shops, visit local tourist sites and put money into the local economy. Also if you book direct with the owner and not through an online travel agency then you will not end up paying ever increasing booking fees. If we have tempted you to take a holiday at Eco-Gites of Lenault with your baby please do get in touch. More details about the gite and the local area can can be found on this website so have a read and then get in touch. Don't forget to check out our special offers including an Early Bird Offer, Ferry Discount and Couples Offer (can include an infant under a year old). Tags: Eco-Gites of Lenault . Baby-Friendly Holidays .